Dough for a pie crust isn’t the only mixture of flour, sugar and fat that gives home cooks pause during the holiday season. Cut-out cookie dough also can be a source of baking anxiety, especially when you’re pressed for time and have tiny helpers who want to be part of the action. If you add too much flour during the rolling process, the sugar cookies will turn out tough and dry instead of light and crisp. And if you are rushed and don’t chill it, the dough will stick to the rolling pin in a maddening mess. But all this dough talk doesn’t have to make you go crazy. To master the art of making cookie dough, see the video on post-gazette.com/food. Additionally, here are some tips and tricks on how to roll out the perfect cut-outs. • Be sure to sift your flour (it will remove any lumps), and use a light hand when spooning it into the measuring cup. If you don’t have a sifter, a fine-mesh strainer also works well. • Make sure the butter is at room temperature (pliable, without being soft and greasy), or it won’t cream properly with the sugar. • Measure ingredients carefully, especially baking soda, too much of which will increase browning. • When mixing wet ingredients, be sure to scrape down the sides of the bowl at least once to make sure everything is incorporated. • Mix dough just until it comes together; there should still be a couple of streaks in the batter. It will be soft and crumbly. • Wrap dough in cellophane and chill in refrigerator overnight, or at least 2 hours. It should be firm to the touch. • If you’re worried about using too much flour, roll dough on a Silpat, or between two sheets of parchment. Make sure you roll evenly so cookies are the same thickness. 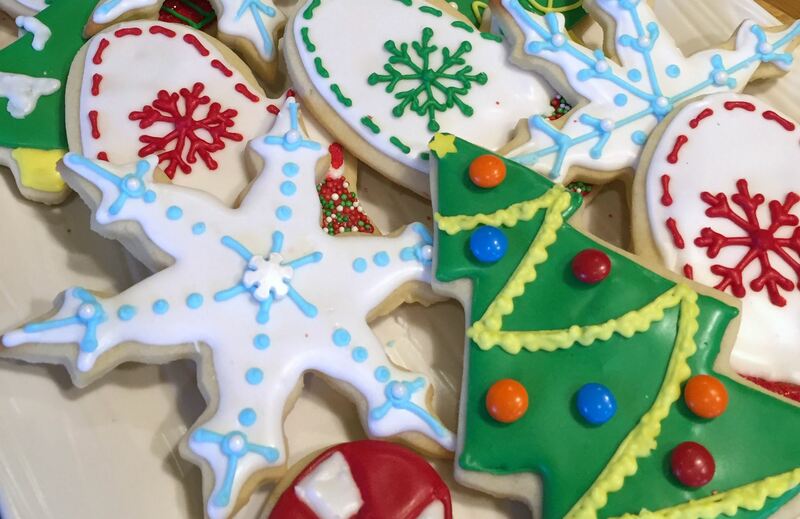 • Dip cookie cutters in flour so the edges don’t stick. Excess dough can be re-rolled up to two times. • Place cookies far enough apart on the sheet so that they don’t bake into one another. • Cool completely on a wire rack before decorating with icing.